Jordan Lindberg must be the only online retailer who earned a bachelor’s, master’s, and doctorate in philosophy from, respectively, Albion College (1991), Michigan State University (1993), and University of Missouri-Columbia (1997). A professor at Central Michigan University from 1997 to 2006, he taught introductory courses in philosophy, along with courses in applied ethics, logic, epistemology, and the history of Anglo-American philosophy. In 2006, Lindberg joined his father’s business, eFulfillment Service, which provides order fulfillment for small and medium-sized online retailers, in Traverse City, Mich. He currently serves as the executive vice president. In 2010, after he had worked with hundreds of vendors — “the equivalent of a Ph.D. in online retailing” — he recognized an online niche when his father purchased a cremation urn for Lindberg’s grandmother. He began researching the $16 billion funeral home industry in August 2010. Lindberg launched Stardust Memorials in mid-2011 with about 25 different memorial products — cremation urns, mainly — sourced from a few domestic suppliers, along with Mexico, India, and China. By the end of 2011, Stardust Memorials had earned $33,000 in gross sales, which increased ten-fold to over $340,000 in 2012. To date, in 2013, gross revenues have been $560,000. “Continuing month-over-month sales growth indicate we could see $1 million in gross sales this year,” Lindberg said. Stardust Memorials runs on 3dcart, which was recommended by a colleague at eFulfillment Service. 3dcart offers good integration processes, including inventory management and reporting, and costs Lindberg $2,040 per year. Lindberg had considered 3dcart, Volusion, and Magento, interviewing retailers using those platforms. Based on their feedback, he believes all three platforms would have been suitable. While he is happy with 3dcart overall, he struggles with its product-option functionality. “Because we offer engraving and personalization on many of our products, along with accessories, we need a robust system for offering and managing product options, but the 3dcart system doesn’t respond well to complicated orders,” Lindberg said. Independent 3dcart website designers created his original website for about $3,500, and they continue to work on small projects. But Lindberg is astonished by those who don’t respond to his request for a quote or consultation. “If they don’t get back to me quickly and professionally, I just go to the next name on the list,” Lindberg said. Lindberg uses PayPal and, for credit card payments, USA ePay. About 15 percent of his customers use PayPal, the rest use credit cards, which cost an average of 2.85 per cent for processing. “We offered Google Checkout but discontinued it, as Google is changing over on November 20 to Google Wallet. Few people used Google Checkout, but those that did really liked it. We doubt we’ll move over to Google Wallet,” Lindberg said. Stardust Memorials’ uses ShipWorks software to manage orders. Lindberg said ShipWorks’ integration with 3dcart is solid, and reasonable at $30 a month. Plus, the ShipWorks’ interface is easy to use and has useful reporting features. “We also tried OrderCup. I liked its web-based nature, but it would not play nice with our label printers and the support was poor,” Lindberg said. Lindberg originally hosted StardustMemorials.com with 3dcart’s basic “under $30 a month” service level. Due to bandwidth and speed needs he now uses 3dcart’s Cloud X service level, at roughly $2,000 per year. “The servers are fast and we experience no downtime. We also get hourly backups. I’m fine with it,” Lindberg said. Lindberg, who soon invited his wife Marcy to join him as business partner, has one full-time staff member, and nine part-time staffers, preferring to hire part-timers as he needs them. “Marcy and I firmly believe that our staff is our number one asset and are really responsible for whatever success we’ve had. I would put my staff up against any company’s staff in the world,” Lindberg said. Lindberg undertook basic search engine optimization for keywords, tags, titles, and custom file names. He added blog posts in the first nine months. He then hired an SEO expert to improve structural issues, and to make the site friendlier to search spiders, which paid off for the first year. “But he didn’t work on getting one-way links from reputable high-PR sites, so I found a wonderful new service for which I pay $2,000 per month for ongoing SEO work, and so far it has been worth every penny,” Lindberg said. 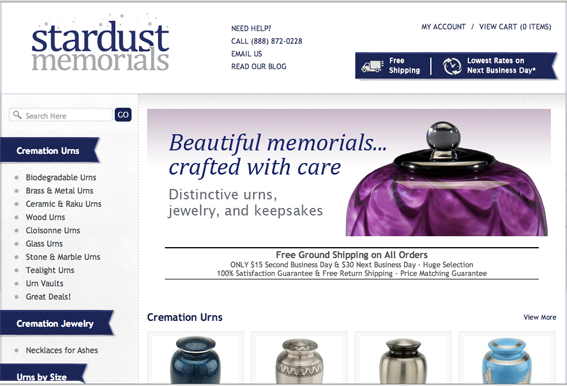 Stardust Memorials now appears on the first page of Google for phrases related to cremation urns, memorial jewelry, pet urns, and flag cases. Stardust Memorials uses (a) FedEx for most items, (b) U.S. Postal Service (via Stamps.com) for lightweight packages to go first-class, priority mail, and to a post office box and a military address, and (c) UPS for international shipping, which comprises three percent of the business. “We’ve also partnered with International Checkout, a great operation as a partner for servicing international buyers. They have a great business model for how to do it right,” Lindberg sad. Lindberg sources 40 percent of products domestically, and the rest from suppliers in Pakistan, India, China, Mexico, and Canada. He has manufactured under contract — i.e., outsourced — from the start. “We’re developing a branded line of funeral supply products unique to us, including hydro-dipped aluminum cremation urns, and also a line of biodegradable urns for natural burials,” Lindberg said. 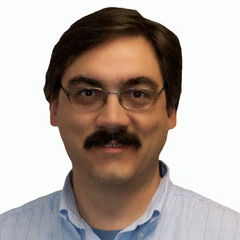 Lindberg, a self-named reporting geek, integrated 3dcart, via a plug-in, with QuickBooks. He added VMware Fusion to his MacBook Pro so that it would run in a Windows environment. He then installed the Windows version QuickBooks. “When the business proved itself, I hired a bookkeeper who does my payroll, and monthly profit-and-loss statements, and balance sheets. We meet once a week for 30 minutes to exchange reports and receipts,” Lindberg said. Lindberg effectively runs his entire company from four Google Drive spreadsheets — regular financials including payroll, metrics data on website performance, weekly FedEx bills, and monthly AdWords cost — spending about 45 minutes daily to collect, enter, and review the information. The spreadsheets allow him to detect oddities early and then do something about them. “For example, payroll runs generally 6.6 per cent of sales, so if that moves up or down much, I look at it,” Lindberg said. Stardust Memorials has Facebook, Twitter, LinkedIn, YouTube, and Google+ accounts, but Lindberg doubts social media assists his marketing. “People don’t think about cremation urns until they need one, and after they purchase one they certainly hope that they will not need another anytime soon,” Lindberg said. Lindberg calls himself a customer service freak, taking a personal interest in every situation his customers encounter. His staff deals with grieving people as they call to order an urn or talk about a product. “Customers often break down in tears while on the call. They have often just lost a loved person, usually a family member. They are often emotional, sensitive, and stressed, and are in need of a little compassion,” Lindberg said. Compassion, respect, and genuine desire to be of service are a prerequisite. But so is attention to detail. “The memorial products are engraved and personalized on our in-house engraving machines. The spelling of names, dates, font, artwork, all the details have to be 100 percent perfect. You get one shot at getting it right,” Lindberg said. Stardust Memorials ships 30 percent of its packages same-day overnight express, or two-day delivery for memorial services. There is no room for error. Mistakes happen rarely, but then Lindberg has his staff do whatever they can to recover the situation. “Sometimes that means a last-minute overnight shipment of an engraved replacement product, early delivery, at our cost — in some cases, hundreds of dollars in a single transaction. Thanks to my incredible staff, we’re rarely in that situation,” Lindberg said. Lindberg believes he has wasted time and money on ineffective pay-per-click advertising. While he believes there is nothing wrong in being experimental when it comes to paid search, he admits in the past he didn’t concentrate enough on channels with a demonstrated history of generating sales. “Even in this last month I’ve tailored our marketing spend to focus on keywords, ad copy, and ad positioning that I know are proven winners,” Lindberg said. Lindberg is proud of his unexpected sales growth, not expecting to succeed as quickly as he has. “We take pride in what we sell. We don’t sell products that are useless, exploitive, dangerous, tacky, or overpriced. We’re really helping people in what we’re doing, and we take great satisfaction in knowing that we’re making a positive difference in the world,” Lindberg said.